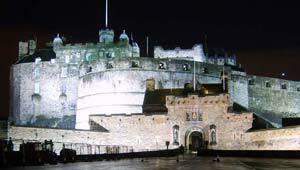 Edinburgh Castle is the city’s most famous landmark and it’s huge! We think this is the must-see attraction in Edinburgh and looking around will probably take you quite a while. Highlights include the Castle Vaults, the Great Hall, beautiful St Margaret’s chapel, and one of the world’s oldest guns, Mons Meg. On top of that, there’s the National War Museum of Scotland, two Scottish regimental Museums and the crown jewels, the “Honours of Scotland”. The other big attraction at the castle for us was the impressive views of Edinburgh. You’re so high up, that everything else is below you and from the castle ramparts, you can see all the main features of Edinburgh City Centre and several miles beyond that. As you’d imagine, there’s a wealth of history here. Human habitation of the castle site is thought to date back to around 900 BC, but there has certainly been a Royal castle here since the time of David I in the 12th century. As such, many of the buildings have been constructed at different stages of the castle’s history and it seems like it’s been a bit of a mix and match approach as you walk around. Our favourite part of the castle is also the oldest, St Margaret’s chapel, which is thought to have been built in the early 12th century and it’s absolutely beautiful inside. Another highlight is the firing of the “one o’clock gun” which takes place at 1pm as a time signal every day except Sunday, Good Friday and Christmas Day. Our recommended hotel in Edinburgh is Ten Hill Place which is a short walk from Edinburgh Castle and the Royal Mile. As always, we only recommend hotels we have actually stayed in and feel comfortable recommending to other people. This hotel was lovely! You’ll find Edinburgh Castle at the top of the Royal Mile overlooking Princes Street Gardens.